1. You must want to quit using smokeless tobacco. If you are not serious about wanting to quit no program will work. 2. Get an oral cancer screening examination. This is important to make sure that no lesion that is present has progressed to a stage that is already cancerous. 3. Choose a flavor of placebo / non tobacco Mint Snuff that you like. None of the Mint Snuff products or flavors taste like tobacco. (Who would want them to?) They all taste much better by most people’s evaluation. For the first week or so mix l (one) part Mint Snuff with 3 (three) parts of your tobacco product. The second week mix 1 (one) part Mint Snuff with l (one) part of your tobacco product. On the third week mix 3 (three) parts Mint Snuff with l (one) part of your tobacco product. From the fourth week or so until you lose interest in any “dip” use the Mint Snuff alone. 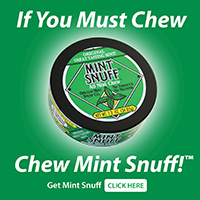 Because the mint product has no nicotine or other addictive drugs, there is no chemically induced or artificial desire to use it, and experience has demonstrated that most people simply lose interest in the use of any snuff product. Courtesy of Dan L. Laizure, D.M.D.